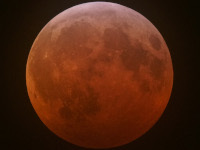 The lunar eclipse of 21 January 2019 was notable in that the moment of greatest eclipse occurred only some 15 hours before perigee. As a result, the Moon appeared slightly larger in the sky than on average (apparent diameter 33' 26" compared to an average 33' 01"). 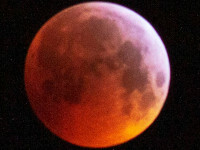 Despite the fact that the difference was not noticeable to the naked eye, the press welcomed the event with the customary hype about a supermoon and even a super blood wolf Moon eclipse. Nine members of OASI reported observations as follows. Nigel Evans. This eclipse would be the first that I would see from my observatory, although the latter stages would be hidden by the house. For once, the last minute weather forecast promised sub-zero clear skies all night, with clouds coming from the north at daybreak. 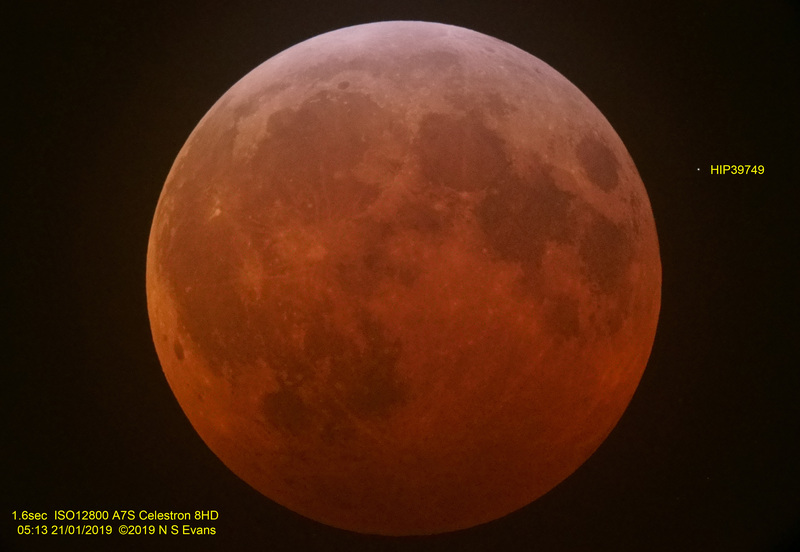 I used my Celestron F/10 8HD Schmidt-Cassegrain telescope and Sony A7S full-frame camera and set up a secondary camera to provide another view of the eclipse. At around 02:20 UT a cloud bank appeared from the north. The Moon was still clearly visible but the sky filled with cloud. 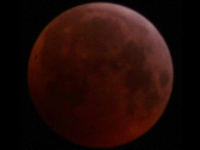 At this point, I packed away the secondary camera, but the main scope diligently continued to follow the Moon. By 03:15nbsp;UT the cloud bank had moved away and the sky became clear again. At this point I started to record the Moon every 10 seconds – the Moon was still bright so low ISO speeds were sufficient. 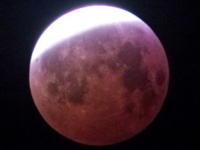 As the Moon moved into the umbra, I increased both exposure times and ISO values until, at mid-totality, they were respectively 1.6 s and ISO 12,800. The Moon was going to be obscured by the roof of my house before the end of totality. But some five minutes before predicted disappearance, the Moon rapidly vanished: I could not fathom what had happened and went outside to investigate to find that another bank of cloud had arrived early from the north, prematurely terminating observations! The eclipse was not particularly deep (the Moon did not pass through the centre of the Earth’s shadow) but it seemed quite dark. 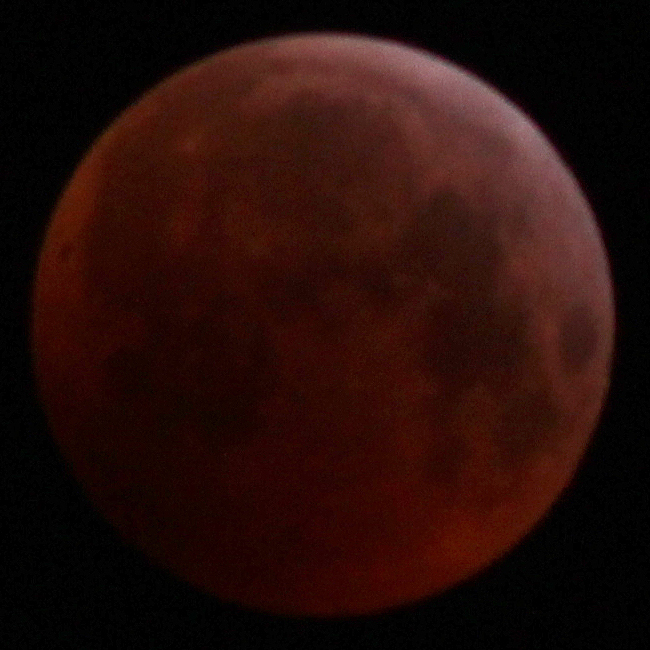 Image 1: 05:13 UT, 1.6 s exposure at ISO 12,800. Andy Gibbs. 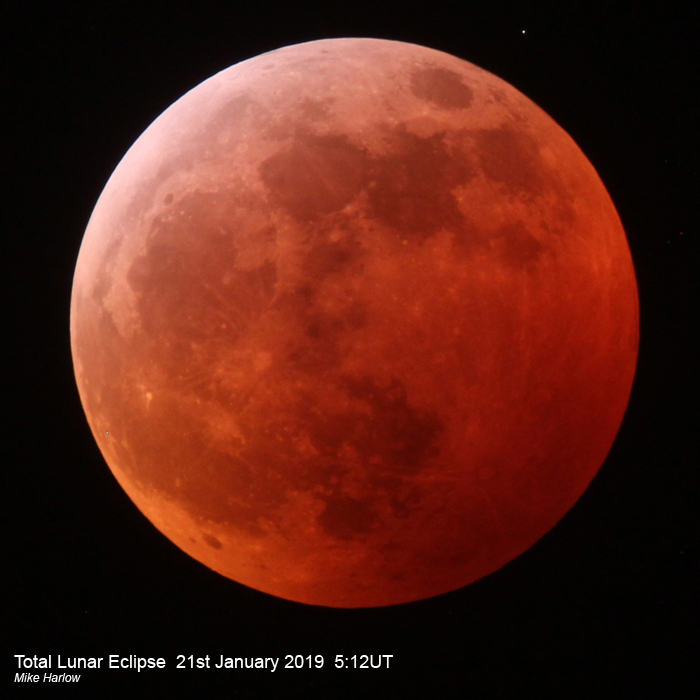 I observed and imaged the lunar eclipse from 03:30 UT, when the Earth's umbral shadow started to appear on the face of the Moon, until 05:45 UT, at the end of totality, when cloud rolled in. I used a Canon 1200D with Sigma 70-300 mm lens at 300 mm. The camera was mounted on a Skywatcher Star Adventurer mount. 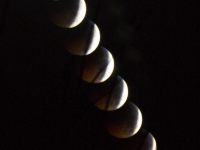 At the beginning of the eclipse I took exposures of 1/125 s at ISO 200; during totality I increased this to 2 s at ISO 400. I captured one image every five minutes. Visually, the eclipse appeared dark, certainly darker than the eclipse I observed in 2007. 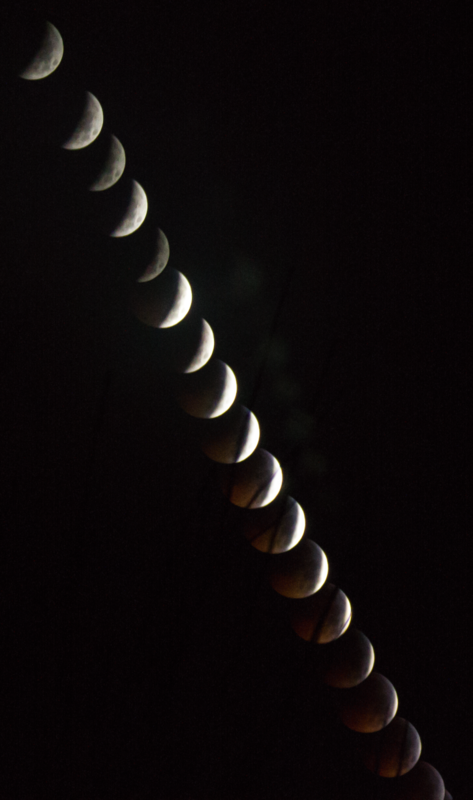 Image 2: 05:01 UT; image 3: 05:16 UT (shortly after greatest eclipse); both 1/125 s exposure at ISO 200, tweaked in Photoshop. Mike Harlow. Image 4: 05:12 UT. Adam Honeybell. Image 5: a sequence of images take 04:21-04:53 UT. John Hughes. Imaging started at 01:30 UT under a clear sky but clouds came in at circa 02.30 UT. As the temperature dropped to -5°C I was tempted to call it a day but, after a cup of tea and a review of the Met office website, I stuck with it as the clouds were forecast to clear about 03:00 UT. Image 6, left to right: 01:49 UT ISO 100, 1/1600 s exposure; 03:39 UT ISO 100, 1/800 s; 04:12 UT ISO 100, 1/250 s; 04.28 UT ISO 100, 1/100 s; 05:08 UT ISO 800, 1.6 s. Images taken with a Canon T3i Rebel attached to a William Optics Z61 refractor mounted on a SkyWatcher EQ2 mount. Mike O'Mahony. Viewing was perfect, quite stunning, in fact. Image 7: 05:50 UT, F/7.5 refractor, Canon EOS 60 Da camera, 1/30 s exposure at ISO 2500. RAW image tweaked to balance over/under exposed areas. Pete Richards. I observed the eclipse with the naked eye. 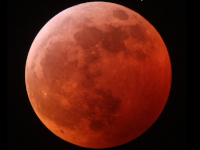 I've seen darker and lighter lunar eclipses in the past. On my own personal observing scale, I call it medium brightness. The colour was a nice red. Very picturesque. Alan Smith. My all-sky camera showed a clear sky until about 03:00 UT, then cloudy, then clear again from about 04:00 UT. 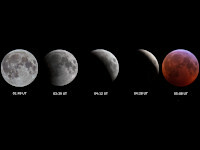 The main stages of the eclipse took place in a clear sky. Prior to the eclipse, the full moon bleached out the sky. As the umbral phase began, the sky rapidly darkened, with more and more stars becoming visible. Totality was slightly obscured by leafless trees! 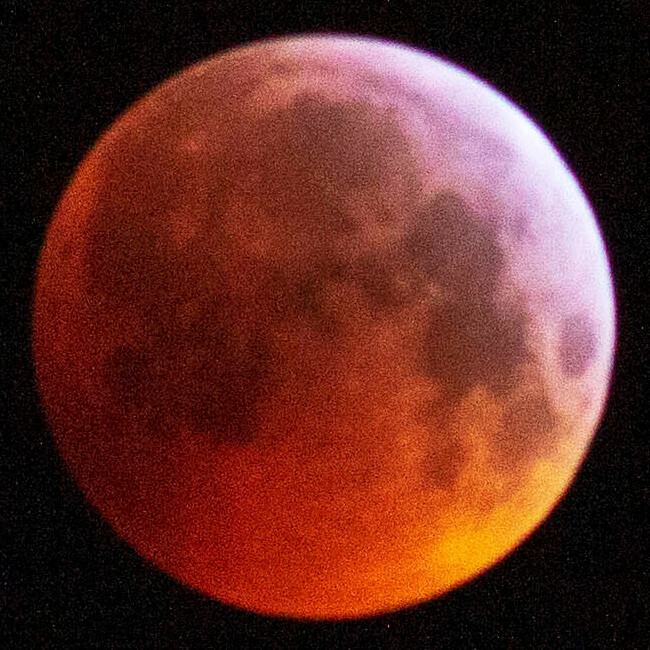 The Moon was very red in colour images. By 06:00 UT, the sky was cloudy again. Paul Whiting. 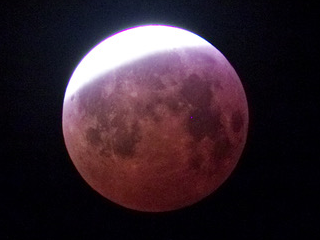 From Devon, I saw the penumbral eclipse briefly at around 03:50 UT, but then was clouded out until it was all over.